The evolution of the mobile strategy at top online tech and electronics retailer Newegg has been nothing short of remarkable over the past 18 months. At the end of 2015, it launched a complete overhaul of its apps and mobile website in a move designed to streamline the checkout process and drive sales – and it worked. The update came complete with search and shopping optimization, iCloud and multiplatform integration, a streamlined purchasing process, and – importantly – mobile-exclusive deals. These deals in particular gave users a real incentive to keep accessing Newegg via their handsets, and enabled the retailer to maintain its competitive edge in the mobile age. The update swept right across the whole Newegg mobile range. A brand new mobile website now makes navigation and product discovery easier, and a product comparison feature allows users to better compare items before purchase. The Newegg iOS and Android apps also received a makeover – they now serve customized homepages which become personalized with shortcuts to most-visited product categories, and throw-up price alerts and recommendations. A new barcode scanner was also added, which enables customers to compare Newegg products with those they find on the shelves of other bricks-and-mortar retailers. What’s more, with in-app-exclusive deals – which no longer require users to enter a discount code at checkout – and the ability to seamlessly jump between devices, apps, and website without losing order or browsing history, Newegg has created a multi-channel mobile shopping experience that is quite simply exemplary. Mobile websites and mobile apps are one thing – and one thing that Newegg is indeed doing well. But there’s another area of digital commerce that is shaping the future for mobile – instant messaging. Once again, Newegg made itself a leader on this front last year when it teamed up with Facebook to provide customer support via Facebook Messenger. Even with its 28 million registered customers and industry leading customer service ratings, Newegg still faces stiff competition from the likes of TigerDirect and Amazon, not to mention traditional bricks-and-mortar retailers such as Best Buy. But Newegg continues to differentiate itself in more ways than one. 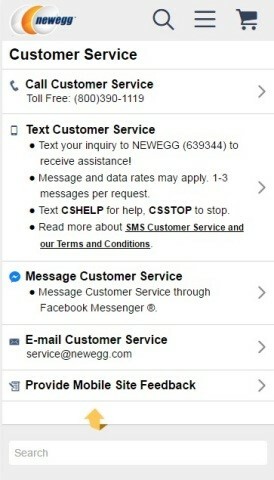 Aside from the superlative mobile experience it has developed across its mobile website and apps, Newegg is also dedicated to offering its customers a whole host of support options, including phone SMS, email, and now a live chat option on Facebook Messenger. With 1.2 billion active monthly users on the platform, Newegg knows that its customers want to reach the company using a service that’s familiar to and convenient for them. During business hours, Newegg customers can now speak with company representatives via the Facebook Messenger app – all they need to do is search for Newegg within the application, or visit the retailer’s Facebook Page and message the support team from there. Customers can check order status, returns, exchanges, or any other issues they may have using the service. It is indeed a smart move from Newegg, which was in fact among the first companies to pilot Messenger for Business when it launched last year. Giving customers the option to engage with Newegg customer support representatives using an app that’s already firmly embedded within their everyday lives allows the company to meet shoppers where they are, instead of insisting that they download the branded app if they don’t want to. What’s more, the convenience offered is highly attractive – no more hunting around for an email address or phone number just to be put on hold; if a customer has a query, they can start a conversation immediately. 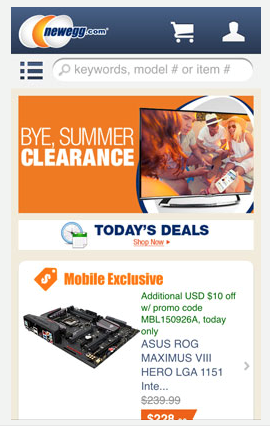 Clearly, Newegg is displaying a forward-thinking approach to its mobile strategy. From a complete overhaul to its own mobile website and apps, to opening up a support service on one of the most popular messaging platforms in the world, Newegg has hatched a plan that’s delivering one of the best mobile experiences across multiple channels retail has to offer; and, in doing so, Newegg is putting itself well ahead of the curve.